After taking a series of cooking classes in Paris last Winter, I realized that it was time to have some dinner parties chez moi to show off my new masterful (!) cooking skills. So when I realized that my one pan large enough to fry one egg in wouldn’t suffice for my underground dinner party guests, I went shopping for new pots and pans. The first thing I noticed was that since I’d last scoured the market, a whole new line of cookware had made its presence known on the store shelves. The most intriguing of these are the ceramic-lined cookware. 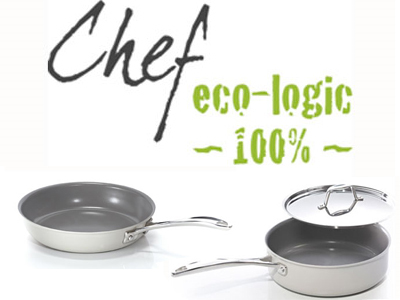 I first did some window shopping in various department and specialty cooking stores and then placed my order with Beka whose Eco Beka line of 100% “Chef Eco-logic” line of ceramic-lined pots and pans had merited the 2009 prestigious Design Plus Award. To really test the efficacy of the both products, I ordered one pan the identical size of the one pan I already had. My old pan was teflon-lined steel – not a cheap version but just last generation pan. 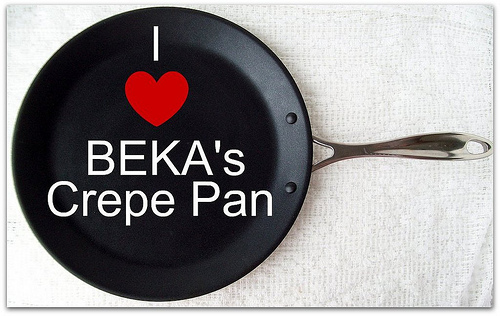 The new shiny white pan from Eco Beka came lined with a beautiful slate gray ceramic. It heats super fast, the hollow handle, metal, stays cool when cooking, I use a tiny drop of oil for non-stick and to steam vegetables I only use a 1/3 of the water. What makes Eco Beka so efficient not to mention aesthetic? 100% environmentally friendly and worldwide exclusive treatment of eco hardened aluminum surfaces. PTFE and PFOA-free thanks to the water-based ceramic coating. No release of toxic substances – neither in production, nor when overheating. Hollow, thermal handle: Fewer materials used which benefits the environment (this keeps the handle cool, unless used in the oven). Beka makes a whole range of Eco Beka. Take a look at the line of pots, pans and casseroles online. And two more things: Super easy cleanup of the nonstick surface. Also, I swear that the fact that they sponsor the Top Chef TV show had no bearing on my decision to purchase Chef Eco-logic 100%. After all, I’m not a Top Chef, I just pretend to be one when I’m cooking at home.